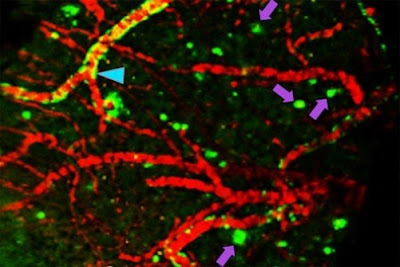 Researchers at Washington University School of Medicine in St. Louis have developed a chemical compound that detects the Alzheimer’s protein amyloid beta better than current FDA-approved agents. The compound potentially may be used in brain scans to identify people in the earliest stages of Alzheimer’s disease. In the image, the compound has passed from the bloodstream of a living mouse into its brain, where it is detected by a positron emission tomography (PET) scan. Arrows indicate clumps of amyloid beta. Newswise, November 7, 2016 — By the time unambiguous signs of memory loss and cognitive decline appear in people with Alzheimer’s disease, their brains already are significantly damaged, dotted with clumps of a destructive protein known as amyloid beta. For years, scientists have sought methods and clues to help identify brain changes associated with Alzheimer’s earlier in the disease process, so they can try to stop or even reverse the changes before they severely affect people’s lives. Now, researchers at Washington University School of Medicine in St. Louis have developed a chemical compound, named Fluselenamyl, that detects amyloid clumps better than current FDA-approved compounds. If a radioactive atom is incorporated into the compound, its location in a living brain can be monitored using positron emission tomography (PET) scans. “Fluselenamyl is both more sensitive and likely more specific than current agents,” said Vijay Sharma, PhD, a professor of radiology, of neurology and of biomedical engineering, and the study’s senior author. “It is a relatively underexplored area in the development of Alzheimer’s pathology,” Sharma said. Using human amyloid beta proteins, Sharma and colleagues showed that Fluselenamyl bound to such proteins two to 10 times better than each of the three FDA-approved imaging agents for detecting amyloid beta. In other words, Fluselenamyl detected much smaller clumps of the protein, indicating that it may be able to detect the brain changes associated with Alzheimer’s disease earlier. To determine whether Fluselenamyl can detect plaques in the brain, the researchers used the compound to stain brain slices from people who had died of Alzheimer’s disease and, as controls, people of similar ages who had died of other causes. The brain slices from the Alzheimer’s patients, but not the controls, were identified as containing plaques. “A huge obstacle with existing state-of-the-art PET agents approved for plaque detection is that they tend to bind indiscriminately to the brain’s white matter, which creates false positives on the scans,” Sharma said. Nonspecific binding to other parts of the brain creates “noise,” which makes it difficult to distinguish samples with plaques from those without. Furthermore, Sharma and colleagues showed that when Fluselenamyl with the radioactive atom is injected intravenously into mice, the compound can cross the blood-brain barrier, bind to any plaques in their brains and be detected by PET scan. In mice without plaques, the compound is quickly flushed from the brain and then excreted from the body. The next step is to move to testing in patients. Sharma already has submitted an application to the National Institutes of Health (NIH) for a phase 0 trial, to establish whether Fluselenamyl is safe for use in humans and behaves in the human body the same way it behaves in mice. Phase 0 trials involve a low dose given to a small number of people to learn how a molecule is processed in the body and how it affects the body. “Ideally, we’d like to look at patients with very mild symptoms who are negative for Alzheimer’s by PET scan to see if we can identify them using Fluselenamyl,” Sharma said.